Before spending money on a portable basketball hoop, this short guide is a must-read. What are the ages, skill level, and size of the players? Will its location be temporary or long-term? Lifetime and Spalding basketball hoops are popular and get good customer reviews. They come in a range of price and performance options. Goalrilla is a popular brand for in ground basketball systems. We'll talk about portable basketball hoops here, but in-ground systems are another option. Want a fun version for the water, air, or game room? Check out our discount basketball equipment page for swimming pool, trampoline, and mini indoor basketball hoops. Portable basketball systems are very popular for driveway and backyard basketball courts. According to Huffy, nearly 80% of basketball goals purchased today are portable systems. Here are some factors to take into consideration as you decide which type of goal is right for you. Check out this list for portable basketball hoop recommendations. One your first considerations is location. What kind of space do you have available for a goal? Watch the short video below by Lifetime products for some helpful information about choosing a goal based on where it will be located. When it comes to a portable basketball hoop, you can basically spend as little or as much as you want to spend. 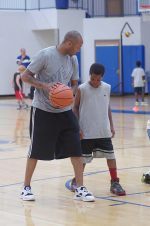 It all depends on the age and skill of your players, how much use you think the goal will get, and the quality and performance you're looking for. You can find goals ranging anywhere from $100 to $5,000+. There are basically 3 categories of portable goals: Basic home, premium, and commercial goals. Basic home goals cost between $100-$500 and can be found in most sporting goods stores. They're ok for beginners and little kids, but most serious players would prefer a more stable, durable type of goal. The backboards on these goals are thin and don't allow for true bounce. And they're definitely not designed for dunking! Several years ago, I bought 3 portable basketball goals in this price range for a little kid's basketball camp I was conducting at our church. We had a tight budget, and I wasn't sure how popular the camp would be with our youngsters, so I didn't want to invest a whole lot. I spent about $200 apiece for them, and they have not only survived a couple years of basketball camps, but here it is about 8 years later and they're still being used at least once a week by the youth group at our church. They're certainly not professional quality, but they have suited our needs just fine. This Spalding Pro Slam NBA goal with a 54" acrylic backboard was perfect for our basketball camps and held up great for years. 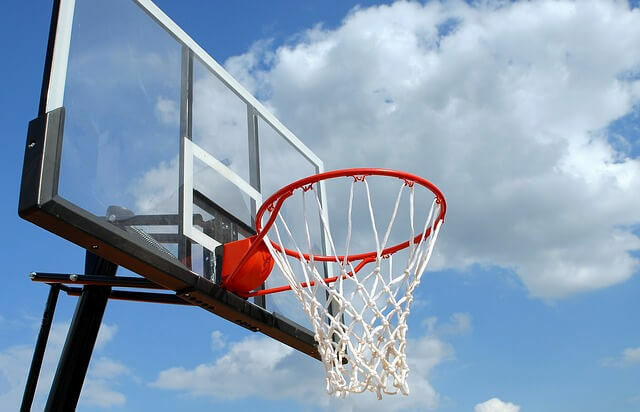 Premium home goals are the next step up in quality and price, and the commercial portable basketball hoops are those used for high-level competition like you'd find on the championship courts at outdoor Hoop-It-Up tournaments and in college and professional basketball arenas. The stability of your goal will greatly affect its performance. If it's not very stable, it will feel flimsy, tip over easily, and vibrate every time the ball hits it. The type of backboard you select also affects this. The lower quality portable basketball goals are not as stable and don't perform as well overall as the higher quality ones. Portable hoops aren't as sturdy as in-ground systems or wall-mounted hoops. Portable goals get their stability by filling their base with sand or water. If you live in a really cold climate, it's possible you'd need to add anti-freeze to the water to avoid the base from getting damaged as the water expands and contracts. Sand bags, cinder blocks, or weights can also be placed on top of the base to increase stability. When properly filled a portable basketball hoop should provide a minimum 200 pounds of pullover resistance. The cheaper models provide as little as 70 pounds and can easily be tipped over with rough play and strong winds. I recommend checking out the goal's stability rating before buying it. Portable hoops are great for driveways, out in the street or anywhere else where you'll need to be able to move them from time to time. They have wheels on the base, so they can be tipped and rolled to a desired location. I will say from personal experience that even though they're portable, the larger basketball systems require a couple of people to move them. Once their base gets filled with water or sand, the unit becomes very heavy and doesn't move without quite a bit of effort. Also, I found it difficult while standing on the ground to be able to reach up high enough to get adequate leverage on the pole to be able to tip it for relocating. You definitely want to lower the goal as much as possible to make it easier to handle. I was able to put all 3 of my portable Spalding basketball hoops together in one (long!) afternoon. It wasn't the most fun I've ever had, but I found the directions to be pretty user-friendly, and the whole process could be completed with the help of a friend. Within a few hours, you can be up and ready to play! Portable basketball hoops often need to be leveled. Whether it's from being assembled a little off balance, getting rattled around from the balls banging off of them, or positioning them on an uneven playing surface, they'll have to be leveled from time to time. The driveway basketball court I played on for years sloped seriously downhill. In a case like this, you need to use a level to get the rim parallel with the horizon. Start by raising the goal to its highest point so it's at its most unstable position. Determine which way the system is leaning and add shims underneath the side of the base that's too low. For example, if it's tilting forward, place shims under the front of the base. For safety reasons, make sure the shims don't stick out from under the base. Using 2-3 solid shims underneath should be enough to stabilize and level it. You can also place additional weight on the side of the base opposite the direction of the tilt. Sandbags, cinder blocks, or free weights work great for this.